View cart “Majacraft Carry Bag – Suzie/Rose” has been added to your cart. 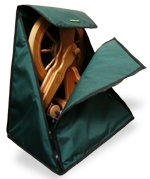 A bag for easy protection and transportation of your Majacraft Rose or Suzie wheel (including Professional and Alpaca). It is produced using very tough PU coated polyester Oxford. Please be aware that Majacraft orders sent to rural address incur extra postage costs – please enquire. Rugged zippers down the front to ease loading the bag. A flap in the top of the bag allows access to the handle on the wheel for transporting it about. Using the wheel handle instead of straps places the wheel in a much more comfortable position to carry.